22-year-old elevator operator Yuria Nagamoto works at Takashimaya department store in Tokyo, Japan October 18, 2018. TOKYO - Japan's capital expenditure boom is shifting to the services sector, stirring fears that self-checkout systems and software will take the human touch out of omotenashi, the country's vaunted commitment to hospitality. For payment, shoppers swipe an RFID card at the entrance and again when they leave. Cameras powered with AI track which products they choose. There are still some bugs: in Kobayashi's case, the system confused his order with that of his co-worker. The staffless store is still being tested but could be opened elsewhere in response to labour shortages, a spokesman from East Japan Railway said. Omotenashi helped Japan rank No. 1 last year in customer satisfaction, according to a World Economic Forum study on tourism. Even workers at supermarkets and budget hotels are trained to bow, speak in polite tones, and are more attentive than most of their counterparts abroad. But Japanese companies now are forced to consider how much of a personal touch they can afford. The ratio of new jobs to applicants is already at a four-decade high and is likely to rise even further. Japan's working-age population will fall 35 per cent to 50.7 million in 2065 from 78.1 million in 2015, the United Nations says. Capital expenditure in the services sector, which started to accelerate in the last quarter of 2016, rose 9.2 per cent in the first half of this year, the fastest increase in almost three years. The investment could pay off in Japan, which has the lowest productivity among Group of Seven countries. Convenience store operator Lawson Inc is testing a system that allows shoppers to scan and pay for goods with their mobile phones. "Our basic philosophy is we put people first," he said. "Omotenashi means you remain at the customer's side, and you see things from the customer's perspective as you show them hospitality." To be sure, some elements of the customer-service tradition are not likely to disappear. Takashimaya's building in Nihonbashi, constructed in 1933, is designated an important cultural property and has elaborate, staff-operated elevators. 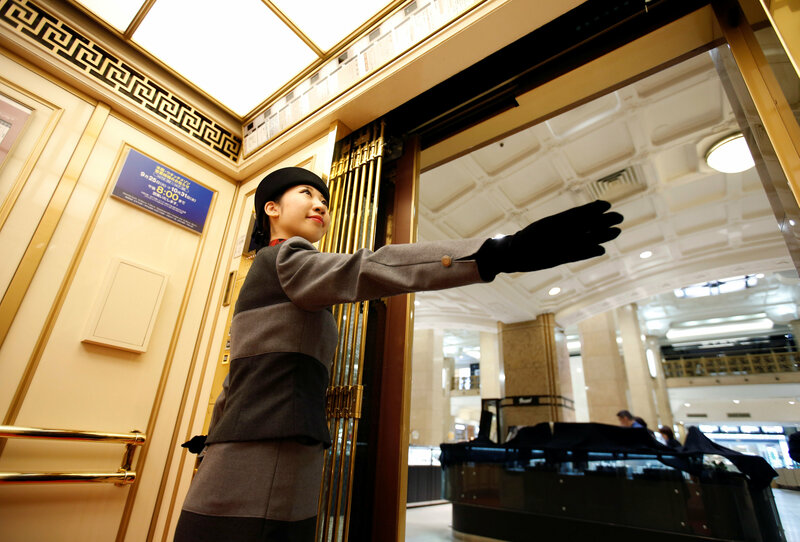 Yuria Nagamoto, 22, has been working as an elevator operator for the past three years. Dressed in a dark uniform and pillbox hat, she announces what items are available before stopping the elevator at each floor. "At Takashimaya, customers ask you so many different questions that I had to study a lot, but it is important to be able to reply to the customers' needs," she said. But some companies say machines help them keep the human touch in omotenashi. Fast Retailing Co has installed self-checkout tills at 195 stores for its low-cost apparel brand GU. The company says that customers like the machines, but that it will not cut staff. "The new system increases efficiency for store operations significantly, hence store staff can spend more time with customers when shopping," a spokeswoman for Fast Retailing said. "This initiative actually improves our service level."